Call 786-797-1728 for more information and to schedule your cooking class or fill out the form below and submit. Learn how to make Chocolate Avocado Pudding, Strawberry Cashew Non-Dairy Ice-Cream, Raw Chocolate Truffles, Banana Chocolate Mousse, Acai Berry Bowls, No-Bake Almond Brownie Bites and many more exciting desserts. Learn how to make homemade Almond Milk and Coconut Milk. Chef Sandi teaching how to make Raw Zucchini Pasta 8/9/18. A Taste of Flavorful Vegan authentic Jamaican and Italian cuisine. It is a fun demonstration class that allows you to relax and watch Chef Sandi prepare the different vegan dishes. The meals are quick, and easy to make. You will learn how to add flavor to your meal with a variety of herbs and spices to make your vegan meals tasty and delicious. You can ask questions during the class, and you will also have the opportunity to taste and enjoy all the Vegan dishes. To schedule a Vegan cooking class or get more information call 786-797-1728 or fill out the Contact Form below and submit. Are you ready to learn how to make a combination of Raw Living Vegan and Vegan dishes with a taste of Jamaican and Italian Flavors. Walnut "Meatballs, with authentic Italian sauce" Vegan Chickpea "Tuna" Cashew Parmesan Cheese, Jerk Tofu, Zucchini Sushi rolls, Vegan Mac n Cheese and many more amazing tasty vegan meals? Fill out the form below and submit your request to schedule your class. IF YOU WOULD LIKE TO SCHEDULE A VEGAN COOKING CLASS OR GET INFORMATION ABOUT VEGAN MEAL PLAN GUIDE PLEASE FILL OUT THE FORM BELOW WITH YOUR NAME AND PHONE NUMBER. AND SUBMIT. WE WILL GET BACK IN TOUCH WITH YOU ASAP. 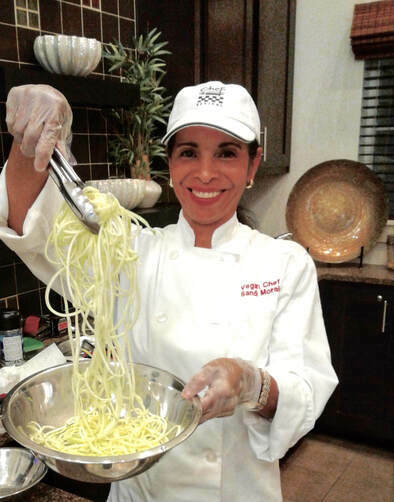 Cooking Class at La Vie Wellness Center Feb 11th, 2016. La Vie Wellness Center - May 2015. La Vie Wellness - April 2015. Black Girls Run Group. La Vie Welness - June 2015 Gaylord Palms Hotel group. La Vie Wellness- Couple Class - June 2015. Cooking Class La Vie March 2016.